A video clip from the mid-way point of the feature race in Conor’s class from MSOKC Race No. 1 is shown below. Conor’s is the silver/black kart out front. He is being followed closely by Angel Wilkinson (orange kart) and Zach Veach (green/white kart). This is about as far apart as they got. 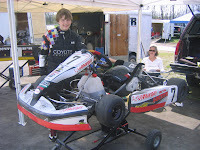 NEWS – The 2008 Mid-State of Ohio Kart Club season got off to a good start this past weekend with MSOKC Race No. 1 at Circleville Raceway Park. The weatherman had predicted a 50-percent chance of rain, but thankfully it held off until the early evening. Bruce Brother Racing managed to squeeze in one complete practice session two weeks before this event, and another one just for Conor the day before, so we were feeling at least somewhat prepared for the season opener. Henry and Peter re-acclimated easily during their single practice session. The only significant change for Henry was a rebuilt top end on his Honda CR 80 engine, so there was no drama there. We stepped Peter up a class for 2008, which involved a new engine with a bit more power than last year and a few chassis adjustments. He took his time coming to grips with these changes, which is Peter’s style. The big question was how Conor would adapt to a new kart after having been idle for nearly 18 months. His new kart is much faster than anything he has previously raced, and we would also have to overcome teething problems associated with unfamiliar equipment. On his first practice lap, he was ‘flat’ (didn’t lift the throttle) through Turn 1. So much for re-acclimation! We made some minor adjustments throughout the day, and Conor had a few spins, but he was able to work his way down to some reasonable lap times by the end. This was encouraging for a race track with little grip so early in the season. In Conor’s second practice session the day before Race No. 1, we broke in some new tires and worked on his stamina (see video clip below). PRACTICE – The first race of the season is always the first chance to see how many competitors there will be in each class. Henry’s class and Conor’s new class were as strong as ever with nine and 11 karts, respectively. We are hoping that the threat of inclement weather was the reason for the poor turnout for Peter’s new class – he was the only one. We scrambled a bit Sunday morning with our preparations, mainly because of unfamiliarity with Conor’s new equipment. Fortunately, as per usual with our friendly club, there was plenty of help close at hand. Henry used the early open practice session to break in his new tires. By the time class practices started, we were pretty much ready to go. Henry and Conor both ran competitive lap times in practice, but we had no reference with which to compare Peter’s lap times. BRIGGS JUNIOR – A decision was made to combine Peter’s class with the class that he ran last year, which also had a disappointing turn out (only one kart). At the start of both heat races and the feature, Peter pulled away and ran laps by himself to the end. His best lap time was a 51.301 seconds, which I’m sure he can improve upon substantially. It’s a bit difficult to push with no competition, especially for Peter who tends to do better when he has something to chase down. We can only hope for a better turnout for Race No. 2. I’m not sure what we’re going to do if this doesn’t improve. 80cc SHIFTER – Henry also started both of his heat races from the middle of the pack (fifth of nine). His first heat was a bit of a melee. At the start, a fast kart that had started from the rear tried to fit through a gap that wasn’t big enough by the time he got there. There was wheel-to-wheel contact and two karts got up on two wheels. One spun to a stop but the other headed toward the fence at an alarming rate. There was only light contact with the fence however, but the race was red-flagged as a precautionary measure. This ended up being a good thing for Henry. He received some light damage from the Turn 1 incident, but he and the remainder of the field proceeded obliviously on their way. On the exit of Turn 5, before the red flag flew, the kart in front of Henry spun and Henry hit him and then got hit by the kart behind him. Henry managed to get going again, but proceeded to the track exit instead to lining up for the restart. He was dragging a side pod and pointing under his right knee in the process. A little muscle was enough to fix the side pod, but his right steering arm, which is supposed to be straight, was shaped like a boomerang. After a little (okay, a lot) of hammering, he made it to the grid just in time for the restart The two karts involved in the Turn 1 incident did not restart, but there were no injuries. I would have been content to see Henry just take the green flag in the first heat, but after running as high as fourth at one time, he managed to finish fifth. Henry’s second heat was much more civilized. He made a good start to maintain his position. He inherited a position on Lap 2 and made a nice pass on Lap 3 to finish third. He also made a good start in the feature to maintain his third starting position. Henry’s feature was much like Conor’s first heat. The leader got away while the kart in front of Henry seemed to be holding him up and the kart behind him was applying pressure. Henry got an excellent run through Turn 4 on Lap 8, however, and was able to make a pass going into Turn 5. He pulled out a gap over the last few laps and eventually finished second to last year’s champion in this class, equalling his personal best in this class. Not a bad return either. NEXT RACE – MSOKC Race No. 2 is Sunday, May 4, 2008. In the mean time, Great Lakes Sprint Series, which is a regional event that enables points to be transferred to the World Karting Association national championship, visits Circleville Raceway Park next weekend. The father of a competitor in Conor’s class, who we have befriended and who have been competing on the national level, encouraged us to enter Conor next weekend. It seems serendipitous so we may decide to give that a try. A short video clip of Conor in his new kart after an 18 month wait is shown below. This is from his second practice session, the day before the first race of the 2008 season.